One of the best known signs in Baltimore was the Circle Bar-B-Q, on Dundalk Ave. The 38' round drive-in was conceived by Francis Gretz. He opened it on July 3, 1947. The Roof was adorned with 4' tall stainless steel letters that were below a 12' round rotating hamburger on a 30' pole. Mr. Gretz retired 50 years later and closed the popular hang out. The letters, containing over one thousand indicator bulbs on a 4 point chaser, were removed. Mr Gretz told me they were made by a 'Fidelity Sign Co.', but nobody in my trade past or present ever heard of that firm. He passed in 2005. After a second life as an ice cream business, The hamburger was removed and scrapped, and the renovated building now serves as the sales office of a used car outlet (Dec. 2008). Originally Fullerton Permanent Building and Loan Association, this 1952 neon display was crafted by Belsinger Signworks. The stainless steel letters contain double-stroke script neon, which was in later years concealed in an yellow acrylic face. Downlighting was achieved through eggcrate diffussers along the bottom. We removed the 30' long display as the bank was preparing to renovate the exterior. Located at 7501 Belair Rd. in Baltimore County, the new facade is quite different from the former neon-adorned froNT. 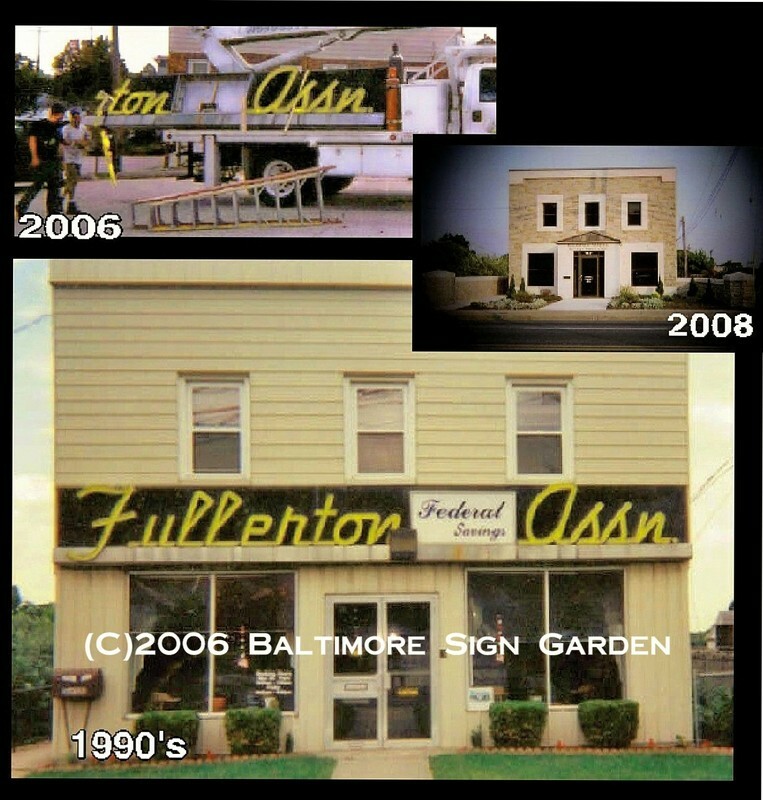 UPDATE: Fullerton was acquired by local Fairmont Federal in late 2011. Woolworth's Greenmount Ave. in Waverly displayed these 5' high backlit molded acrylic faces from the late 1950's. 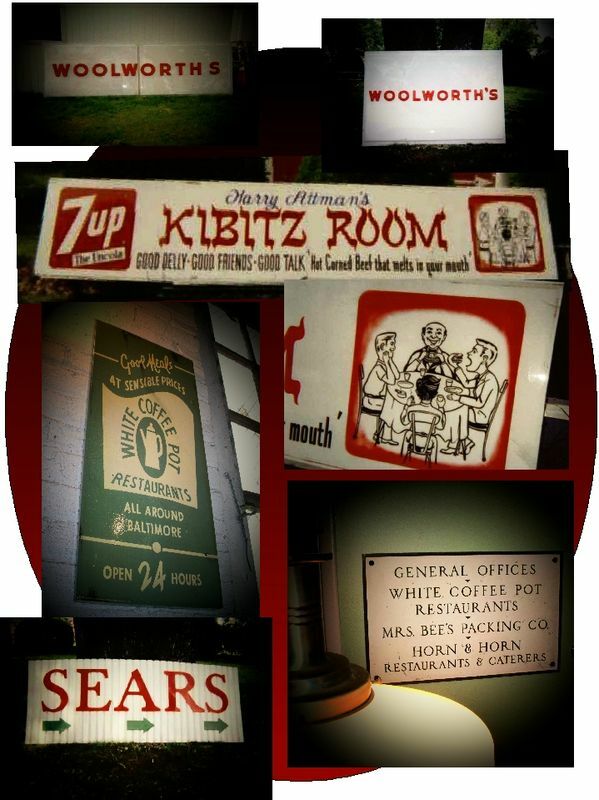 Other acrylic inserts are Attman's Deli on E. Lombard St. This 1960's acrylic backlit face features Seymore Attman and a young Harry Attman, smoking a cigarette on the sign! One of my very first rescues was the 3' by 9' corrugated acrylic SEARS sign. 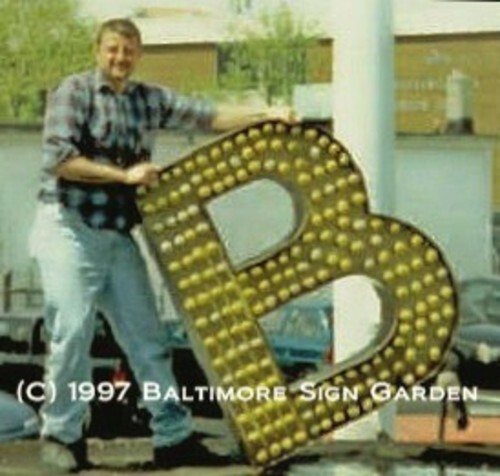 This was the secondary entrance sign at the old Glen Burnie store, from 1967. The lighted pole sign was dropped in 1986 for the creation of West Ordnance Road. (I also have a neon unit reading 'OPEN TO-NITE' which was lit during late shopping hours). White Coffee Pot is represented with a porcelain enamel steel pan sign, original location unknown. The cast plaque is from thieir old headquarters/commisary, Warwick Ave and Frederick Road in Baltimore. White Coffee Pot is still a corporation, now known as Cactus Willy's. CAMEO THEATER Opened as the Parkside Theater in 1921, It went through several owners when it became the Cameo in 1938. By the late 1950's, the theater had been showing art and german films when it closed. 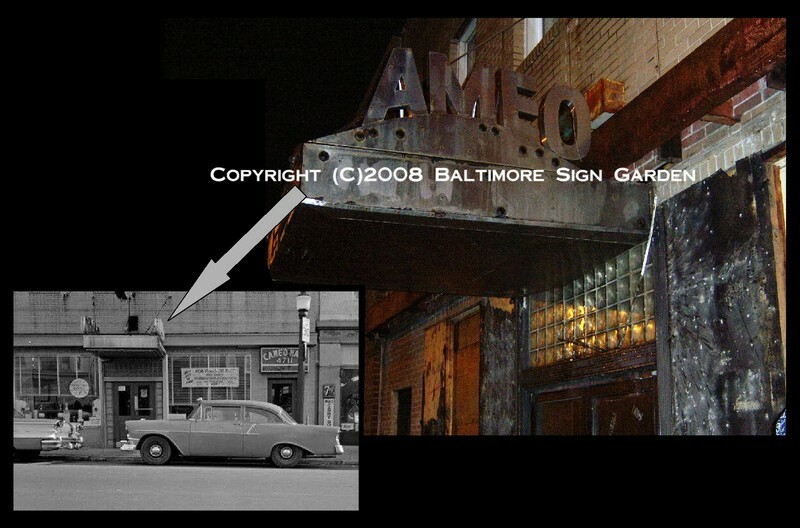 The second half of its life had the Harford road facility catering and entertaining as a niteclub, still called the Cameo. Covered over for almost 50 years with lighted sign boxes, the original 1938 stainless steel clad canopy with attatched neon letters were revealed, and the letters were rescued. The canopy was demolished. The buildings later uses included nightclub, catering facility and a few eateries. In the summer of 2018 it was gutted, and is being rebuilt into community office space. The refreshed facade includes the old glass block transom over the entrance doors. Located on Cold Spring Lane in Roland Park, this little appliance store remained fully stocked but closed for 25 years. The interior was like a movie set from 1977. The porcelain sign needed no restoration. 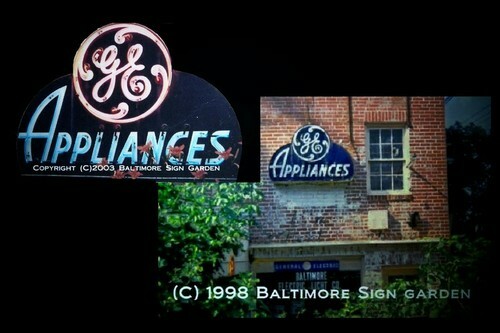 Released to me by a family member upon the store owners death, The late 1940's sign lit right up. The ceramic cat, mounted on the wall in the picture to the left, was also removed and takes its new home with the sign. 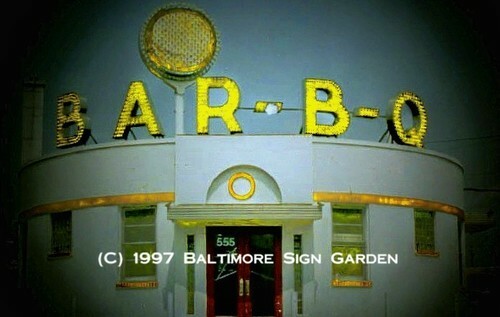 (It's a Baltimore thing!) Mass produced by Flashtric Neon, Chicago.